A compact 4x4 offering from the Japanese manufacturer that will cope as well in the heart of the city as it will when the going gets tough. Rugged looks are blended with a practical interior that offers an impressive amount of passenger and boot space for a vehicle of this size. 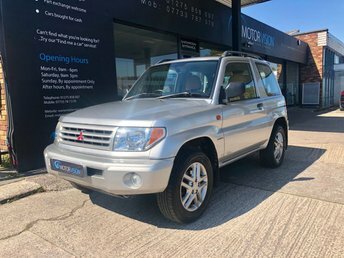 Why not find out more about the range of used Mitsubishi Shogun Pinin models for sale in Bristol right now by contacting the team at Motor Vision. You can also browse our stock right here on the website. Every vehicle we sell comes fully inspected to ensure our customers get to enjoy complete peace of mind.